For other places with the same name, see Concepcion (disambiguation). Concepción  is the second largest city of Chile with a population of over 900,000 as of 2002. It is on the coast of the Biobío Region. Concepción was founded by Pedro de Valdivia in 1550 north of the Bío Bío River, at the site which is today known as Penco. At that time it was given the name Concepción del Nuevo Extremo. More than once the city has been destroyed by earthquakes and tsunamis. One in 1570, another on the 25 May 1751, at which point it was decided to move Concepción further from the sea to its present location in the Mocha Valley. Today Concepción (or "Conce", as Chileans call it) is the second largest city of the country. 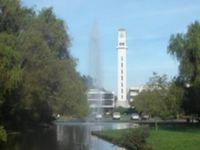 The Universidad de Concepción, founded in 1919, and with its main campus in the city became the first private university in Chile. The neighbouring harbour of Talcahuano holds the largest naval base in the country. The Gran Concepción is the name that receives the whole metropolitan area, which includes Talcahuano, Hualpén, San Pedro de la Paz, Chiguayante, Hualqui and Penco. You can fly to the city via LAN  or Sky Airline . The famous Pan-American Highway, referred to locally as "Ruta 5" or the "Norte-Sur", connects Santiago south to near Chillán (approximately five hours), meeting international standards for the most part. Outside of Chillán then take the "Autopista del Itata" (Ruta CH-152) west for about an hour. Buses end at the main terminal in the center of Concepción, the Terminal Collao. Buses depart every half an hour from Santiago. Buses are the quickest form of public transport in Chile. Unlike Europe, train services are scarse and the journey take 2-3 times longer than by bus. 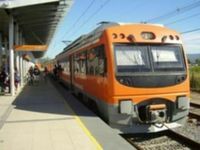 There are at least two non-stop express services that connect Santiago and Concepción, EME Bus and Pullman Tur (not to be confused with Pullman Bus), which take no more than six hours. Fares can vary from CLP$6000 CLP (USD$12) to CLP$14000 (USD$28 USD), depending on the season, seat and day of the week. The TerraSur train links Santiago to Chillán in 4.5 hours. 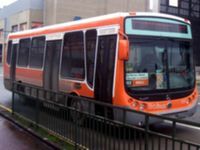 Previously a bus transfer to Concepción included in the ticket price was available, however this service was suspended indefinitely on 5 January 2009 and now must be purchased separately. The transportation system has buses and shared taxis services that reach every single place in the metropolitan area. 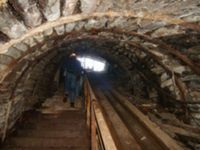 there is a comnmuter train service (BioTren) that reaches the surrounding areas. 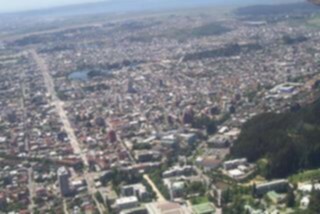 Hualpén (through Concepcion-Talcahuano Highway) Las Golondrinas (Line 40), Buses Mini Verde (Line 41) and Mini Buses Hualpencillo (Line 42). Hualpén (through Colon Avenue) Nueva Sotrapel (Line 12), Ruta Las Playas (Line 30), Las Golondrinas (Line 40), Buses Mini Verde (Line 41), Mini Buses Hualpencillo (Line 42), Flota Las Lilas (Line 43), Flota Centauro (Line 44), Buses Tucapel (Line 60), Buses Cóndor (Line 65), Buses Puchacay (Line 71), Vía del Sol (Line 81), Among others. San Pedro de la Paz Nueva Llacolen (Line 20), Riviera Bio Bío (Line 21), San Pedro (Line 22), Buses San Pedro del Mar (Line 23), San Remo (Line 24), Las Golondrinas (Line 40) and Rengo Lientur (Line 63). Chiguayante Vía Láctea (Line 10), Via Futuro (Line 11), Nueva Sotrapel (Line 12), Via Siglo XXI (Line 13), Chiguayante Sur (Line 14), Via Universo (Líne 16), Expresos Chiguayante (Line 17), Buses Palomares (Line 18), Las Galaxias (Line 80) and Vía del Sol (Líne 81). Penco Expresos Chiguayante (Line 17), Ruta Las Playas (Line 30), Ruta del Mar (Line 31), Buses Ruta del Mar (Líne 32) and Mi Expreso (Line 62). Hualqui = Las Galaxias (Line 80) and Vía del Sol (Line 81). just inside Concepción Buses Pedro de Valdivia (Line 72), Buses Tucapel (Line 60 Z & M) and Rengo-Lientur (Line 63). Learn Spanish, because of its weather, friendliness of its people, and many students around, this is a great place to learn Spanish. Several schools are available. I did a course with HelloChile ([email protected]) and it was really good. The boss (Gerhard, an Austrian who is since decades in this region) also helps out with every question concerning tourism and traveling and has been to almost every tiny town in Chile. Regional Stadium, it is the main and biggest stadium in the metropolitan area. It hosts Universidad de Concepcion and Deportes Concepcion matches, ticket prices vary from CLP$2000 (USD$4) to CLP$5000 (USD$10) depending on the match. CAP Stadium, inaugurated in 2009, it is a new and modern stadium that hosts Huachipato matches, ticket prices are more expensive at CLP$4000 (USD$8) as it has a very comfortable accomodations. El Morro Stadium, a historical English design stadium, is the host for Naval matches. During the 60's the Brazilian superstar Pele, played with his team Santos here. Destroyed by the 2010 earthquake/tsunami it is not advisable to visit. Federico Schwager Stadium, The host for Lota Schwager, its abandoned condition makes it not advisable to visit. No info about prices. El Pueblito and Fería Artesanal del Bio Bio, both located within the centre of the city in the same block, in Freire street between Colo Colo and Anibal Pinto. The best place to buy souvenirs related to the city. Mall Plaza Mirador Bio Bio, on Los Carrera street. You can get there by Biotren or by bus from different places of the city. Is a smaller version of Mall Plaza Trebol, with some stores and a smaller food court, a cinema and amusement arcade. Is not as frequented as the other shopping malls, so it's more pleasant to visit. 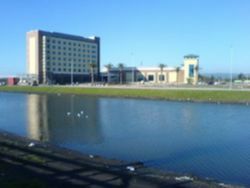 Mall del Centro, on Barros Arana 1068, in the heart of the city. You can get there by Biotren or by bus from different places of the city. 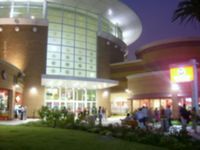 A large shopping mall with food court, cinema amusement arcade, departament stores and several stores of renowned brands. La Fuente Alemana, O´Higgins with Rengo (a block or so from the Plaza de Armas and Cathedral)- the go-to place to eat the completos which Chileans love so much. (FYI completos are a hotdog with mayonnaise, tomato, and avocado). Go downstairs for a quick snack or upstairs for table service. 30 Express, Plaza Peru, empanada specialists serving every flavor combo imaginable. Good beer is also readily served up here. Clean, good service and friendly staff. La Fina Estampa, San Martin with Angol, Peruvian restaurant serving good fresh seafood and great Pisco Sours. Quite a sophisticated place but the pricing is reasonable. Tijuana, On the way to Santa Juana (take a car/taxi), Mexican food. All you can eat on Thursday nights and Sunday lunchtime. While the food is more like a Chilean take on traditional Mexican food, it is delicious and has a great atmosphere with lively music and friendly staff. Tijuana express is in the Plaza Peru - a much smaller venue and limited menu but just as good. Concepción is full of bars and nightclubs so try the traditional Pisco Sour cocktail, a Piscola or even a beer from the German-settled south of the country. Bar Bonita, Rengo 1624, great bar, you cannot really notice it's a bar from outside, but once you'll get in you'll love it. Live music and sketches on Wednesdays for a small entrance fee. Hotel Alborada. A hotel with a nice "green" entrance, three to four- star environment. Do not visit Talcahuano's seaport, Hualpen and nearby areas at night, especially on weekends. Other residential areas such as Chiguayante, San Pedro de la Paz, are worth visiting but have their dangerous places also, so be careful when going unaccompanied by people who live there or know the place well. Population is very tolerant and friendly. As the rest of country, this city has a largely conservative Catholic and Protestant population but Freemasonry has here, an important influence in culture, education and business. Very strong social movements and political activity, sometimes heavily polarizated, be careful while discussing topics such as Pinochet's regime or the War of the Pacific. Travellers should be aware of the recent political history of Chile as the country was under the rule of Augusto Pinochet for many years following the 1973 military coup over the Socialist president Salvador Allende. Foreigners should be respectful when approaching this topic and in fact it is best avoided unless you are in the company of Chileans you know well or those who bring the subject up willingly themselves. Mind your manners, in contrast with the rest of Chile, Concepción is highly populated by university students, so they can understand if you are talking in English. Chillán, a small central city with quaint attractions. Isla Mocha is an island that can be reached from Tirua, a journey five hours south by bus. Santiago, the capital is just a six hour bus journey away and buses run frequently so if you need a taste of the big city life, it´s not too far. This page was last edited on 31 December 2018, at 02:49.